U.S. Air Force and Navy pilots could soon be flying on renewable fuels, specifically, biodiesel made from camelina and algae. 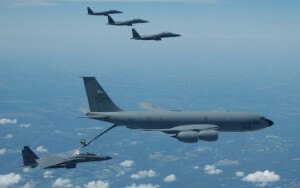 The Defense Energy Support Center (DESC), which buys fuel for the services, has awarded contracts to supply almost 600,000 gallons of renewable jet fuel for testing and certification. “That’s an unprecedented amount,” says Kim Huntley, DESC commander. Sustainable Oils, Solazyme and Honeywell company UOP will supply 400,000 gallons of fuel to the Air Force and 190,000 to the Navy. Sustainable Oils will use camelina as the feedstock, Solazyme will use algae and UOP will use animal fat, or tallow, supplied by food producer Cargill. All three will use UOP’s processing technology. The military is working on guidance for what the best feedstock for biofuels should be and is leaning toward cellulosic feedstocks for the long term.